Title: Abilene Reporter-News – Mobsters reveal ugly secrets about our nation, leaders . 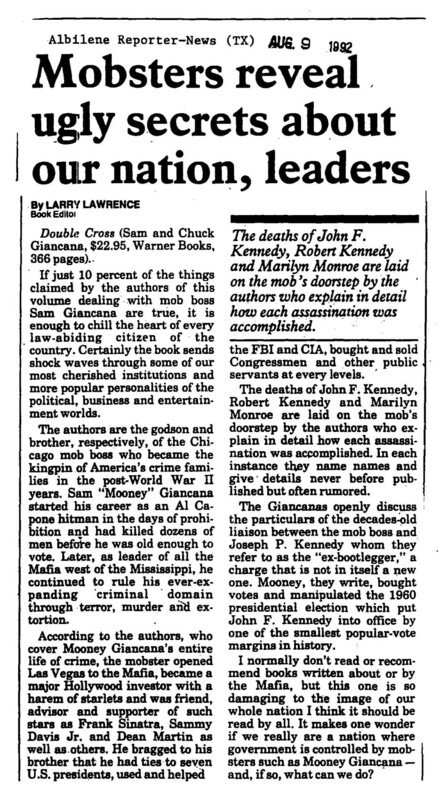 If just 10 percent of the things claimed by the authors of this volume dealing with mob boss Sam Giancana are true, it is enough to chill the heart of every law-abiding citizen of the country. Certainly the book sends shock waves through some of our most cherished institutions and more popular personalities of the political, business and entertainment worlds. The authors are the godson and brother, respectively, of the Chicago mob boss who became the kingpin of America’s crime families in the post-World War II years. Sam “Mooney” Giancana started his career as an Al Capone hitman in the days of prohibition and had killed dozens of men before he was old enough to vote. Later, as leader of all the Mafia west of the Mississippi, he continued to rule his ever-expanding criminal domain through terror, murder and extortion. According to the authors, who cover Mooney Giancana’s entire life of crime, the mobster opened Las Vegas to the Mafia, became a major Hollywood investor with a harem of starlets and was friend, advisor and supporter of such stars as Frank Sinatra, Sammy Davis Jr. and Dean Martin as well as others. He bragged to his brother that he had ties to seven U.S. presidents, used and helped the deaths of John F. Kennedy, Robert Kennedy and Marilyn Monroe are laid on the mob’s doorstep by the authors who explain in detail how each assassination was accomplished. The FBI and CIA, bought and sold Congressmen and other public servants at every levels. The deaths of John F. Kennedy, Robert Kennedy and Marilyn Monroe are laid on the mob’s doorstep by the authors who explain in detail how each assassination was accomplished. In each instance true names and give, details never before published but often rumored. The Giancanas openly discuss – the particulars of the decades-old liaison between the mob boss and Joseph P. Kennedy whom they refer to as the “ex-bootlegger,” a charge that is not in itself a new one. Mooney, they write, bought votes and manipulated the 1960 presidential election which put John F. Kennedy into office by one of the smallest popular-vote margins in history. I normally don’t read or recommend books written about or by the Mafia, but this one is so damaging to the image of our whole nation I think it should be read by all. It makes one wonder if we really are a nation where government is controlled by mobsters such as Mooney Giancana – and, if so, what can we do?